Convenience store brands that outperform on critical differentiating attributes attract twice as much customer spending as those that do not, according to findings from BCG’s most recent survey of convenience store shoppers. From 2009 through 2013, the three top-performing convenience-store brands not only captured the greatest share of wallet in the format but also saw their combined share grow at a faster rate than that of all the other convenience-store brands we considered. Indeed, our survey indicates that the industry dynamic is shifting: leaders that continue to differentiate their offerings are capturing an increasing share of the segment’s overall value, whereas laggards are falling behind at a significant rate. To understand their priorities and to identify factors that distinguish convenience store leaders over time, BCG periodically conducts a survey of representative consumers across the U.S. The 2013 survey—which was preceded by surveys asking the same questions in 2009 and 2012—had 2,000 respondents. We asked these consumers about more than 30 attributes that affect their purchasing decisions and about their satisfaction regarding more than 35 top convenience-store brands. We used share of wallet as a proxy for overall performance, because brands with a high share of wallet tend to have superior economics. Our survey enables us to not only identify the differentiators of the past and present but also understand trends in consumer attitudes and behaviors that strongly indicate which differentiators will be important in the future. Our findings can help convenience store brands become aware of these trends and position themselves for success through three sets of critical attributes that will be decisive in years to come: persistent differentiators, evolving enablers, and emerging delighters. To highlight what matters most to consumers and drives performance for conven­ience store brands, we created a matrix that synthesizes two sets of inputs. The first set comprises consumers’ stated preferences regarding the 30-plus attributes we tested. This testing involved analyzing responses to direct questions about the role each attribute plays in consumers’ determination of which convenience stores to patronize. But because consumers’ stated preferences do not always correspond with their behavior, we also took a less direct approach to determine what consumers value. The second set of inputs comprises derived preferences, which we identified by asking them about their experiences shopping at more than 35 top convenience-store brands. We also conducted parallel analyses to understand how each variable of a retailer’s performance is linked to shopper satisfaction and share of wallet. By analyzing these inputs, we have identified factors that drive shopping behavior. Differentiators. These are attributes that are highly valued but perceived by consumers as relatively rare—the basis of distinction for retailers that may translate into a higher share of wallet. They are attributes that consumers directly indicate are important and that measurably affect how those consumers think about the brand. For example, cleanliness is a differentiating attribute that strongly affects consumer satisfaction and choice as well as retailers’ share of wallet. Essentials. These are the attributes that are valued but also expected by consumers; they’re the table stakes and not a basis of distinction for retailers. For example, the ability to pay at the pump is essential for convenience stores that sell fuel—but it does not boost share of wallet because consumers consider it to be standard for the format. Indeed, retailers that do not deliver the essentials are likely to lose consumers, but essentials provide little opportunity for differentiation and rarely enhance business performance. Delighters. These attributes are welcomed but not expected by consumers; delighters are a potential future basis of distinction for retailers. For example, some convenience stores are stocking good-quality, fresh food—pleasantly surprising many consumers and enabling some retailers to lay the foundations for future competitive advantage. Convenience store leaders need to carefully prioritize these various attributes in order to drive customer satisfaction and brand performance. (See Exhibit 2.) Cleanliness, for example, falls in the differentiators quadrant. It received a high score on stated importance because consumers indicated that they valued the attribute highly when we asked them whether cleanliness is an important factor in their determination about which convenience stores to visit. It also received a high score on derived importance because consumers’ overall satisfaction with particular convenience retailers strongly correlated with how consumers rated the retailers’ performance on cleanliness. It is worth noting that consumer expectations, as captured in the stated-versus-derived matrix, vary across retail segments. For example, cleanliness is an essential attribute—not a differentiator—in many retail formats, such as grocery. In most regions of the U.S., it would be extremely detrimental for grocers if consumers perceived their stores to be unclean. But consumers notice significant variation in cleanliness among convenience store brands, and some brands have succeeded in differentiating themselves by focusing on this attribute. Furthermore, attributes can cycle through the quadrants over time. In some cases, those introduced in the convenience store format as innovations may unexpectedly delight consumers at first. They may then become important sources of differentiation that enable retailers to drive satisfaction and capture a disproportionate share of wallet. Eventually, they may become essential table stakes that all retailers must provide just to compete in the space. In other cases, attributes that have become table stakes may migrate to the differentiator quadrant, perhaps because of changing conditions that cause consumers to rethink their earlier preferences. 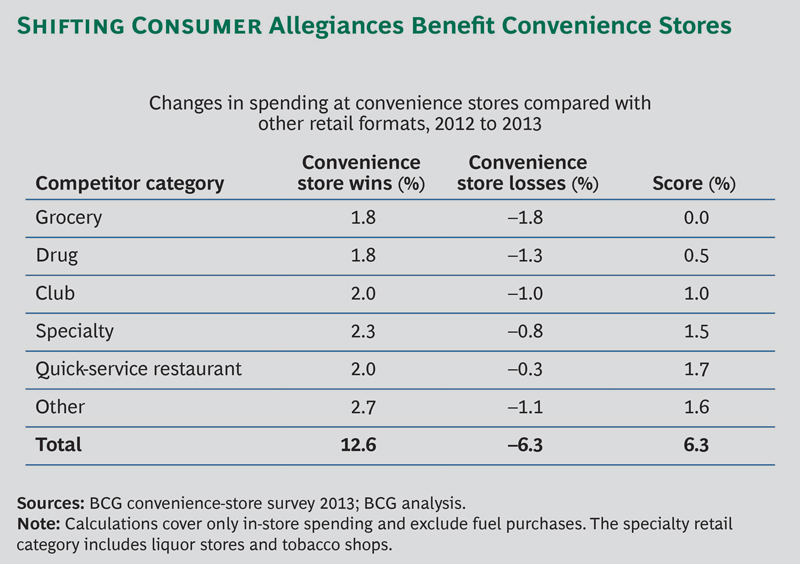 Convenience store brands that outperform on differentiating attributes capture a higher share of wallet. Our research indicates that those with the highest score on differentiators capture nearly a 40 percent share of wallet, whereas the share of those with the lowest scores barely exceeds 15 percent. (See Exhibit 3.) Indeed, the top five brands average twice the share of wallet as all the other retailers we considered. Our research also suggests that the top convenience-store brands have been increasing their lead. As these brands have improved their performance on differentiators, the portion of consumers who said they concentrate all their spending on one or two brands rose from 35 percent in 2009 to 45 percent in 2013. Over this same period, the three brands with the highest share of wallet saw their combined share grow at a rate that was 4.5 percent faster than the combined rate of growth for all the other brands we considered. This recent growth was partly driven by switching from other retail formats—particularly the quick-service restaurant, specialty liquor and tobacco, and club formats. (See “The Complications of High Switching Rates,” below.) Indeed, it appears that increasing numbers of consumers believe select convenience-store chains offer attractive fresh-food alternatives to what is available at quick-service restaurants. The retail landscape became more complex over the past year, with consumer allegiance (as measured by nonfuel purchases) shifting significantly among formats. Yet convenience stores captured a larger share of the overall retail market in 2013 than in 2012. As the exhibit below illustrates, convenience stores made their largest gains from specialty, club, and quick-service retail formats. And even though grocery stores and drugstores accounted for meaningful shifts away from the format by some customers, gains in other customers entirely offset the losses to the grocery format—and even resulted in minor overall gains from drugstores. The future performance of convenience store brands will be affected primarily by the trends shaping three sets of critical attributes: persistent differentiators are the attributes that have been highly important sources of distinction for retailers since 2009, evolving enablers have long been relevant but whose importance has changed significantly in recent years, and emerging delighters are innovations based on newly relevant attributes that are poised to become important sources of differentiation. An analysis of the attributes that constitute these three categories highlights not only what matters to U.S. consumers today but what is likely to matter most to them in the future. Leading convenience-store retailers that provide these critical attributes could capture as much as $1 million greater revenues per store than those retailers that do not. Attributes in the persistent-differentiator category have remained in the differentiator quadrant since we conducted the first BCG convenience-store survey in 2009. Consumers value these attributes highly, and retailers that outperform in this area get higher scores on satisfaction and capture a larger share of wallet. Evidence suggests that these attributes will continue to be determinant in the foreseeable future, even though it may seem surprising that some of these attributes have not yet become table stakes in the industry. Indeed, many convenience-store brands are still not consistently meeting the basic consumer demands for the convenience format. It is critical to remember, however, that consumers require brands to deliver the following essentials before they give incremental credit to retailers that invest in differentiators. Cleanliness and Safety. Retailers—many of which hire third parties to conduct regular cleanliness evaluations in their stores—may be surprised to learn that consumers think many convenience-store brands fall short of the mark in this area. But less than 60 percent of respondents said that the top-performing convenience-store brand is clean, and a little more than 30 percent said the lowest performer is clean. Consumers’ perceptions of whether a store is clean are affected by a variety of factors, not just by how spotless the store appears. Brands that score high on cleanliness maintain their stores in a pleasant-smelling and stain-free state of good repair, and they ensure that fixtures, displays, and equipment are kept up-to-date with evolving standards. The brands that landed the top five spots in cleanliness captured an average share of wallet of 33 percent, whereas the bottom five captured an average share of only 18 percent. Consumers’ responses and behavior indicated that they had similar perceptions about standards of safety at convenience stores. Friendliness. Staff friendliness has correlated strongly with satisfaction and share of wallet every year that we have conducted our survey. Convenience retail is a face-to-face business, and consumers often visit the same stores regularly and come to know store owners, managers, and clerks. Interactions with staff strongly affect the in-store experience for consumers, which shapes their overall perception of the brand. Top brands establish processes for identifying recruits with good people skills, train the staff on how to develop strong relationships with customers, and provide incentives to reward high performers and encourage them to stay with the company. Location and Convenience. Consumers indicated that easy-access and high-traffic locations are important in every retail format, but this is particularly true for convenience stores. Nearly 50 percent of customers said that the ability to satisfy an impulse quickly is a major factor motivating their use of convenience stores. One-third said that they use convenience stores primarily because they are located on a planned travel route, and stores with outlets located “along the way” or “close to home” received higher satisfaction scores from consumers than those that are not. Brands can also increase the convenience of existing locations by updating landscaping to ensure the stores are easy to see and reach, participating in municipal decisions about traffic flows, and encouraging complementary businesses to locate their stores on the same site to enhance the attractiveness to consumers. Speed. Sixty-four percent of convenience store customers said they choose convenience stores over other forms of retail because they want to complete their shopping as quickly as possible. In fact, speed and ease draw consumers to convenience stores from other formats—such as grocery and drug formats—more than just about any other attributes do. Such attributes are particularly important to consumers who said they do not want to visit large stores to pick up a few small items. Innovations in payment systems and mobile offers that focus on the customer experience or make checkout easier and faster are likely to be critical to brands’ efforts to provide a quick and easy experience in the future. These attributes have been important since 2009 and have moved among the three more meaningful quadrants (delighters, differentiators, and essentials) since then. An attribute that has been a differentiator for a while often becomes a table stake at some point, losing its power as a source of competitive advantage as more companies address the attribute. Alternatively, changes in markets and consumer perceptions can open opportunities for retailers to focus on attributes that are low priorities, enabling them to develop a new competitive edge. There are two areas in which these dynamics are unfolding in the convenience store industry: brand trust and fuel price. Brand Trust. This attribute addresses whether consumers believe they will have the experience they expect to have when they enter a brand’s outlets. Brand trust is distinct from overall brand perception, although trust strongly affects perception. First and foremost, brand perception is about ensuring that the brand promise focuses on attributes that matter to consumers. Trust is about consistent performance. To earn a high score on brand trust, a retailer must consistently deliver all the attributes that it claims in its brand promise. Inconsistency will diminish brand trust, and overall brand perception will erode. Research we conducted ten years ago suggested that convenience store customers were unconcerned about brand trust with regard to convenience stores. (Although they were concerned about brand trust when it came to fuel, which affected convenience stores that sold gasoline.) By the time we conducted our survey in 2009, brand trust fit into the delighters set of attributes. Innovation has flourished in the convenience format over the past decade, and in recent years top convenience brands have become more consistent in following through on their brand promises. There was still broad variation in performance in this area in 2013: top companies were trusted by nearly 90 percent of respondents, whereas those ranked lowest were trusted by less than 50 percent. And those that earn customer trust reap valuable rewards: the group of customers that shop at only one or two convenience-store brands increased in size by 29 percent from 2009 to 2013. (See Exhibit 4.) Although we expect brand trust to be critical in the future, it is likely to become one of the essential table stakes for most customers. Six broad trends are shaping the attitudes and behavior of convenience store customers. Macroeconomic Volatility. Anxiety is rising because of the stuttering recovery from the financial crisis, weather variability, high degrees of political partisanship, and continued marketplace uncertainty. More-Discerning Customers. Consumers are becoming more thoughtful about how and where they shop. Those hit hard by economic trends are trading down for lower prices and embracing private-label options. Select customers are also trading up in “feel good” categories because they are unwilling to compromise on perceived quality. Growth Demographics. An aging population shifts economic burdens to younger people and creates demand for new products and services. The increase in the number of Millennials and Hispanics in the U.S. brings unique and more diversified consumer demands. “No Compromise” Consumers. People are no longer willing to make tradeoffs among taste, convenience, and health—and they increasingly prioritize sustainability (although many are unwilling to pay more for it). Reformation of the Retail Landscape. Nontraditional formats such as dollar stores, club chains, and e-commerce are threatening those that have been traditionally dominant, such as grocery retailers, putting pressure on margins and market share. Rise of the Digital Economy. Social media and the delivery of information in real time are moving the center of power toward consumers—although big data allows some retailers to benefit from this shift. The attributes in this category are those that have moved from being low priorities to differentiators between 2009 and 2013 and are the basis for many emerging innovations in the convenience format. A few convenience brands may have focused on them for a while, but these attributes have only recently emerged as statistically meaningful to convenience store consumers. The retailers that provide these attributes often boost their satisfaction ratings, but consumers do not yet consider these attributes to be primary reasons for choosing one brand over another. That is likely to change. Attributes that delight today often become the differentiators of the future. Brands that invest in innovation (particularly through a dedicated innovation team) tend to discover and shape the delighter attributes, and they are often well positioned to claim opportunities for differentiation as a result. Only after delivering essentials and established differentiators should brands focus on delighters But leaders also excel at building innovation pipelines that are focused on transforming the following delighter themes into future bases of differentiation. Good-Quality Fresh Food and Coffee. For convenience consumers, quality and freshness have to do primarily with flavor and the eating experience, not with healthy ingredients. (Healthy food remains in the low-priority category for most consumers.) Innovation in food and food processing has been a hot topic among convenience retailers for many years, but our research indicates that consumers increasingly recognize and appreciate quality and freshness in the food they buy at convenience stores. Although these attributes are delighters for most consumers, they are already becoming differentiators for a subset of consumers particularly attracted to good-quality fresh-food options at convenience stores. And for this subset, healthy food is already a delighter. As more customers try quality fresh food from convenience stores, demand is likely to rise—turning this attribute into a differentiator for the average consumer. Healthy food may also become a delighter. Select consumers already say that they prefer convenience stores over fast-food outlets for convenience as well as for the higher quality and wider range of fresh food and coffee. Indeed, brands seeking to increase their fresh-food following may be most likely to reach consumers first through coffee, followed by breakfast items, then hot and chilled lunch and dinner options. Low Prices. Convenience stores have not been known for offering low prices or good deals. In fact, many customers say that they expect to pay a “convenience premium.” But a number of convenience retailers have begun to shift the dynamic by offering sale prices and promoting sales in their advertising. Consumers are taking notice. Satisfaction levels are rising for convenience brands that offer good deals, suggesting that good deals could be a differentiator in the future. Targeted promotions, mobile coupon offers, and limited-distribution coupons are all likely to become more important in the future. Loyalty Programs. These had little impact in the convenience space until recent innovations began to change consumers’ perceptions. Two types of loyalty programs have sparked particular interest: fuel points programs offered with partners and exclusive reward programs. Fuel points programs involve striking partnerships with other retailers, such as grocers, that enable consumers to earn points they can cash in for fuel discounts at a convenience store. Forty-five percent of customers who use fuel points programs reported that they increased their fuel spending at the participating fuel outlet, and 30 percent reported that they increased in-store spending on nonfuel items. Nonetheless, convenience retailers must manage fuel points programs carefully to ensure that consumers do not come to expect fuel price relief as one of the essential table stakes too quickly, inadvertently shrinking the window of opportunity for using fuel pricing as a differentiator. It is also worth noting that brands will have to work with financial partners to offer fuel points programs. Exclusive reward programs enable customers who shop at a brand’s convenience stores to earn points that can be cashed in for rewards or store credit. Reward programs are less common than fuel programs, but 45 percent of consumers who used them reported that they increased their spending at convenience stores that offered rewards. Trends suggest that both types of programs have the potential to become strong bases for differentiation in the future. Indeed, both tap into consumer interest in good deals, while fuel points programs tap interest in fuel pricing—two related trends. Loyalty programs also provide brands with consumer data that can be mined for insights, enabling companies to refine their offerings and extend their advantages. It is important to note that different attributes will be important to different customer segments. Some attributes are differentiators across the board, but some are differentiators for certain segments and not others. Convenience retailers should focus on the attributes that matter most to the segments they target. Millennials, for example, are particularly concerned with safety. They also value stores that stay open late or never close, and they consider good packaged-food options to be essential. Good breakfast and tobacco choices can be delighters for Millennials. Most Hispanics prioritize speedy transactions and competitive fuel pricing. Brand trust, which very strongly correlates with satisfaction for Hispanics, is a differentiator for this group. Consistent pricing is an important satisfaction factor for most Hispanics, but good deals are not as important to them as they are to other customer segments. Overall, brands that outperform in the area of persistent differentiators are winning a growing share of the pie. Leaders that want to improve their companies’ position must focus on attributes in this category. They must also deliver evolving enablers—attributes that may have lost or gained power as differentiators over the past five years but continue to be critical to success. And they should keep an eye on emerging delighters, which are likely to be the bases for innovation and to become the differentiators of the future. There are three broad implications for convenience store brands seeking to maintain or improve their position in the format. No brand is likely to excel in all differentiators, but leaders will meet a standard in most areas and will excel in delivering selected attributes. Outperform on established differentiators. It is clear that providing differentiating attributes drives share of wallet. Every convenience-store brand should focus on the five areas of differentiation that our survey shows will be important to consumers in the foreseeable future. These are cleanliness and safety, speed and ease, friendliness, fuel price (for brands that offer fuel), and location and convenience. Indeed, these areas will remain critical even after they no longer constitute a basis for differentiation. Brands should conduct deep consumer research on a continuous basis to ensure they understand how to apply the differentiating power of these attributes in their unique context to reach their target customer segments. This is particularly important today because of the rapid pace of change in the industry. Secure brand trust by clearly defining and consistently providing the brand promise. To establish trust, brands must identify the attributes they wish to be known for and clearly spell out how they will deliver them. Brands must also focus relentlessly on execution to ensure they consistently provide their prioritized attributes in every store. Brand trust is no longer a differentiator for convenience retailers; those that are not trusted to provide what they promise will not thrive and may not survive in the future. Thus it is critical for convenience brands to not only develop creative marketing strategies to communicate and reinforce their brand promises but also build the necessary capabilities and culture to ensure that each store consistently comes through on every promise the brand makes. Focus innovation on emerging differentiators. Brands should always be developing new areas of differentiation to stay ahead of consumer needs and secure their future basis for competitive advantage. Attributes in the delighters quadrant of our matrix have already been proven to drive satisfaction, and they are likely to drive share of wallet in the future. Brands should develop innovation pipelines to stake claims on attributes in the delighters set, ensuring they will have a future basis for differentiation from competitors. Those willing to experiment are most likely to succeed. Brands should consider developing approaches to quickly test their ideas with consumers, refining those that show promise to get them just right—and dropping those that do not in order to make room for other experiments. Digital innovations could prove particularly powerful, because they can enable retailers to capture rich data about consumers and generate insights for future differentiation. Top convenience-store brands are expanding their lead by focusing on differentiators that drive consumer satisfaction and correlate with a high share of wallet. The key to future success in convenience retail hinges on the ability to determine which attributes are or will be sources of differentiation, which are essential table stakes, and which do not matter to target customers. Those that build their strategies around the differentiators could secure a spot in the winners’ circle, capturing up to twice the share of wallet as those that do not. The authors would like to acknowledge the contributions of Patrick Hadlock, John Budd, and Shankar Raja.